Reproduction dynamics and phenotypic changes in the tick-borne encephalitis virus (TBEV) population during long-term infection, feeding of ixodid ticks, and at different temperatures were studied. The temperature significantly influenced the level of TBEV reproduction in ixodid ticks. However, more rapid and intensive TBEV reproduction was observed in feeding ticks as compared with infected ticks kept at elevated (32–37°C) and room temperatures. 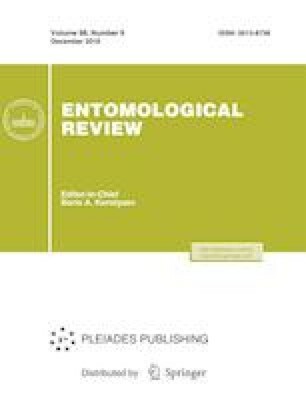 TBEV strains of the European and Siberian subtypes successfully replicated and formed long-term infection in ticks that are both primary (Ixodes ricinus, I. persulcatus) and secondary (Dermacentor reticulatus) virus vectors. The strain of the Siberian subtype reached its maximum titers in D. reticulatus, and the strain of the European subtype, in I. ricinus and D. reticulatus. Prolonged reproduction of the European and Siberian TBEV subtypes in both primary and secondary vectors increased heterogeneity of the virus population; however, virus variants retained high neuroinvasiveness characteristic of the virus adapted to mouse CNS cells. TBEV strains of different subtypes varied in the phenotypic population heterogeneity under different conditions. Unlike Absettarov (European subtype) strain, the population heterogeneity of EK-328 (Siberian subtype) strain by the plaque phenotype on PEK cell culture was significantly influenced by feeding of D. reticulatus ticks after long-term reproduction of the virus in them. Original Russian Text © O.A. Belova, I.S. Kholodilov, A.G. Litov, G.G. Karganova, 2018, published in Parazitologiya, 2018, Vol. 52, No. 4, pp. 268–282.